I've posted about my issues with bread-baking here and here using my mom's recipe, but I never did get it to work out perfectly every time. When I had Jack, my friend Emily brought soup and bread to us one night for dinner. It was so good, and she offered to have me over for a long playdate one day to show me exactly how she does it. She starts, as did my mom, with whole wheat berries that she grinds into flour. I don't have a grain mill (yet) so I go with the same brand of flour, Wheat Montana, which is nonGMO and can be purchased in bulk on amazon. There is only one store locally that sells it, and that's Wal-Mart, though I've requested it at two other grocery stores, so we'll see if they start to carry it. I love the Prairie Gold varietal, because it doesn't produce too dense a bread, but their other varietals are great, along with the all-purpose flour, which is a natural white flour; unbleached and unbromated. The recipe she uses for her everyday bread is the Fresh Milk Bread from The Laurel's Kitchen Bread Book, with a lot of' 'you'll know it's ready when it feels like this' and she'd pinch the dough between two fingers looking for the perfect amount of give. It was the best, most generous thing for her to host us for about four hours on a sticky, summer day. She walked me through each step, fed my kids lunch and sent me home with a loaf of fresh bread. I ordered the book right away and embarked on my quest to replicate. After several months, I've had consistently good bread and am so grateful to her. My kids are brimming with gratitude as well. I believe H's direct quote was 'Can't we just buy bread at the store like normal people?' Brats. I do a one and-a-half batch of this bread to make three full loaves. My kitchen aid won't work a full double batch. The big-daddy kitchen aid is next on my appliance upgrade list. Also, I find that it's really important to weigh your flour because the way you scoop and measure it, may make the difference of about a cup when you compare weight to volume. For almost four years we've lived with a huge master closet that has the most dysfunctional storage, so it looks like a giant craphole about 90% of the time. Coming from apartment living, it felt pretty ungrateful to complain about a closet that could serve as an extra bedroom in a pinch. Once every six months or so, I go through and make it all pretty again, but it doesn't last long because there's not a home for everything. Add having a giant rolling laundry cart that takes a big chunk of the floorspace, and it just looks bad. I swear, we're not giant slobs but you'd never know it to see our closet. Last year we got an estimate for a closet system that was so ridiculous, I was glad I was holding a cup of coffee in front of my mouth when he read out the number because my jaw dropped and I closed it just in time to let him know we'd get back to him. Then a friend got her closet done and it was gorgeous. I had All City Closet (Formerly Tri-City Closets) come give an estimate and it was significantly lower than the competition, and instead of drawing up a quick plan at my table, they took all of the measurements, a list of our needs and requests and rendered drawings for me about three days later along with the estimate. It was spot on with what I wanted. Over J's drill weekend, my mom came and helped me drag everything out of the closet, sort it, goodwill it, yardsale pile it and every other tedious thing you do with a closet that's bursting at the seams. Here's the ugly before, which I really didn't want to take, but it makes the after so much better. Doesn't my side look so much less cluttered than J's? Oh, wait, that's because all of this was shoved under the shelf; a big basket of clothes waiting to be consigned, two laundry baskets of clothes that the kids had outgrown and needed to be sorted, plus random bags from day travel and swim lessons...oh the treasures to behold. Closet emptied, it was time to tear out the old shelves. I think a lot of basic closets have this issue; decent square footage, but not big on storage. After I used a rubber mallet to get all of the shelves up, I texted the foreman for our builder to make sure the wooden supports were just nailed and not glued/nailed to the wall. I was not excited at the prospect of replacing the drywall. Once I had assurance they were nailed only, I thought it would be easy-peasy. Not so. Those suckers were securely affixed! The conversation with my mom went something like this (as I was grunting with effort to get the board to even wiggle). Mom: I bet they're glued. Me: They're not glued. Just nailed. Mom: Hm. They seem like they might be glued. Me: They're not glued, I asked the foreman. Mom: (after I'd used a screwdriver to try and get behind a board and succeeded only in gouging the drywall). I bet dollars to donuts they used glue and he just forgot. Me: THEY'RE NOT (insert word you should not scream at your lovely mama) GLUED TO THE WALL! I decided to put down the sharp objects at that point and ask dear Facebook what a girl should do. I was given a lot of good suggestions, including the one from my husband that said 'Um. Leave it alone. I'll fix it when I get home.' Since I knew that a pretty closet was not high on his list of wants for the house, I figured that chiseling lumber off the walls of said closet after driving three hours to get home from working all weekend was likely not high on his wishlist either. When I told him I couldn't wait for him because I needed to paint, he replied 'Are you going to drywall as well?' Oh, ye of little faith. A neighbor so kindly dropped by that night with three wood shims, a prybar, spackle and a multi-use paint tool. I could have kissed her. The next morning, I spent a good hour plus gently loosening, pry, pry prying and then putting a little muscle into it once I'd gotten a good purchase. I was trying to leave all of the pieces intact so we can reuse them to create more storage in other areas of the house and donating what we don't end up using. Next to deal with the dingy paint color. I used just one good coat of Enamelware by Martha Stewart color matched to Behr Ultra Paint Plus Primer in satin finish. I plan to use the same color on the bathroom in the next few months. These were taken about 8pm after I was done painting last night. The carpenters came at 9am, and when they were done at 2, this is what I have now. I couldn't be happier! Shoes and bags will all have a home, and there will no longer be a shelf full of shoes sitting just under the window. 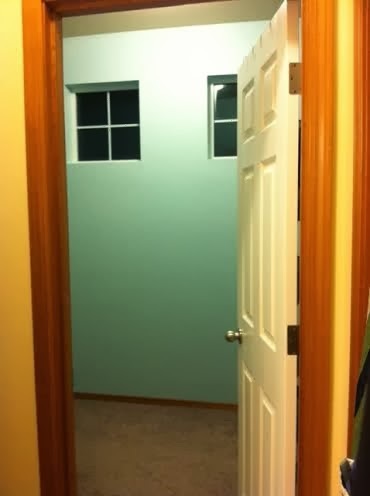 These windows are the front of my house and if the light was on in the closet, you could see stuff sticking up from outside. Not attractive. There is a row of four wire baskets at the very end, and they pull all the way out and are removable. The system is fully adjustable and if I find that I need something different as time goes, we can always have them come back out and make the changes we need. I couldn't be happier! Now to put all of our clothes away. In rainbow order, of course. Updated with more photos for your viewing pleasure-J and I stayed up after he got home from work last night and got it all squared away. It feels so nice to have a home for everything with room to spare. I have a few ideas to decorate the shelf below the window simply. 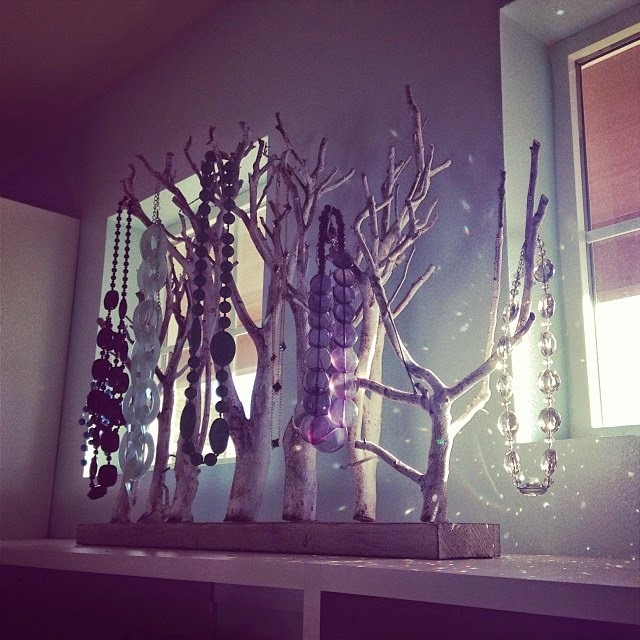 I added this branchy thang to hang my necklaces under the window-purdy! With the boys getting older, I've had to get more selective about the things that I blog about, taking into consideration that which may embarrass them. It took a couple days for H to find the humor in this one, but he's on board now. It may end up being one of those 'you had to be there' things, but it's a slice of our life so here you go. When the kids piled out of the car last week after getting home from school, they grabbed their umbrellas from the garage and proclaimed today the perfect day to have umbrellas outside. I recalled the drive home in hard rain with wicked wind and disagreed. However, they were not to be swayed. I snapped a few photos of the windy fun, and then went inside. Approximately two minutes later, H ran inside laughing saying his umbrella was 'inside out'. I glanced at it and said 'Yeah, it's broken.' I started laughing at that point, and the exchange went something like this? 'It's broken?!' 'Yes.' 'Really, Really broken?!' 'Yes.' With each disbelieving question, I asserted and began to laugh harder (while snapping pictures because, well, why not?) because it was clearly mangled. Maybe it's just inoperable for a moment?! Understandably, he was not stoked to pose with it. Charlie to the rescue. And then, Mama to the rescue. All's well that ends well. And why yes, that is a polar bear in his pocket. How else does one transport their stuffy friends? I decided to start doing two weeks of meal planning at a time. The week goes so quickly and, before I know it, I'm staring down Sunday with a dwindling produce selection and not a lot of inspiration. The meals for the following week that can be made ahead and frozen will be, and grocery shopping will be more streamlined. With a five person family, I still try to stay under $800 a month in groceries, and most of the time I'm able to, with some flex for the months of heavy meat purchases. Once I made the commitment to buy only organic and/or free-range meat, I also had to concede that we'd have less meals that included meat so I've been delving into my queue of vegetarian meals. A lot of people shy away from vegetarian meals because they think they'll lack flavor or substance, but that's just not true, it's all in the seasoning and the selection of produce and protein. I've been pretty salad-heavy in my lunches lately, but will be trying these Eggplant Pizzas from Julia Child as a way to change things up. There are so many good, healthy and hearty options, there's no reason to be left eating your kids' cast-off crusts, or a crappy protein bar on the run. It takes a little more planning and prep time, but once you get in the habit it just becomes part of your day. Friday: Pizza Playdate Dinner-For all the mamas whose husbands work late or travel, it's one night a month that we don't have to worry about dinner alone. I love Valentine's Day, but this year, I was determined to do it on the cheap. Because who doesn't love a cheap date?! Not only did I want to find something that was inexpensive, but after last year's cookie bouquet debacle, I was also looking for something dead simple. Without thinking about the date on the calendar, I planned a trip to visit a girlfriend, putting me home late the night before the day of love and actually being out town during Charlie's party, for which I volunteered to make cupcakes. Naturally. So I needed to have everything done and ready for the kids to assemble while I was gone; I filled out Charlie's for him, but Henry did all of his own. For the kids' class exchange a free printable, lollipop bags from my party supplies and a few bags of Swedish fish created a cute valentine with a small amount of candy. Goldfish crackers, which we already own, could have been used, but I had zero faith that a bunch of tiny bags of goldfish crackers would get to school un-crushed, so sugary red dye number whatever for the win! A few of the teachers got the same valentine as the kids, but for the classroom teachers and the school secretaries, I found this free printable which I printed onto pink cardstock from my paper stash and fastened onto re-usable cups you can buy at Starbucks for $1 each. I was at Safeway and planned to buy the reusable cups you see on display, but at $6 each, it didn't really fit into my V-day on the cheap scheme. I remembered the cup I'd purchased for my own use the month before, and snapped up several of them. I had planned to get Starbucks giftcards to go with each one, but then saw the new latte versions of Via. I picked up a couple of four-pack boxes, but then saw the single serve 'try before you stock up' samples that were $1 each. Hmm..same product size and almost half the price. Why yes, yes I did clear them out. 1-2 in each cup along with brown paper lunch bags that I cut into strips and crinkled, reminiscent of cafe au lait (and also free). I added in peppermint kisses because I still had an unopened bag of them that I didn't use for midnight kisses on New Year's. Valentines day at under $25 out of pocket for two kids; teacher gifts and classroom exchange combined, not too shabby!